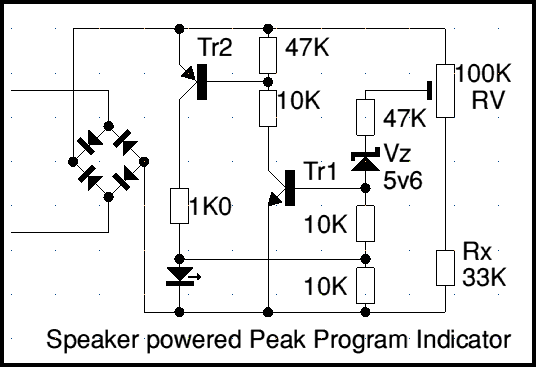 This circuit requires no battery, being powered from the loudspeaker signal it is detecting. When the voltage being delivered to the speaker exceeds the level set up by the preset RV, the LED indicator flashes. The trigger level is adjustable from Vx to where so with the values shown detected voltage is 6v minimum, 27v max, eqivalent to a power (into an 8 ohm speaker) of 4.5w minimum, 72 watts maximum.